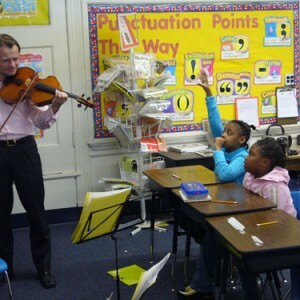 ClassNotes is a non-profit organization of professional musicians committed to sharing classical music with schools and communities through interactive workshops and concerts. By fostering interdisciplinary connections and placing music within a broad social context, ClassNotes seeks to inspire engaged listeners and empathetic citizens. ClassNotes’ musicians are members of the world’s top orchestras, and have performed as soloists with the New York Philharmonic, the Chicago Symphony, the Moscow State Symphony and the Philadelphia Orchestra, among others. Competitions and awards include the Naumburg Foundation Awards, Avery Fischer Career Grants, Concert Artists Guild International Competition, Young Concert Artists International Competition, and Washington International Competition, among others. 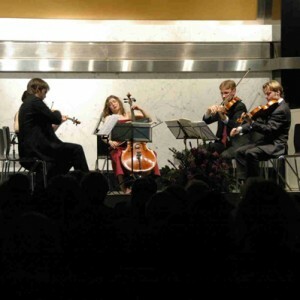 As chamber musicians, ClassNotes’ artists have performed at the Chamber Music Society of Lincoln Center, the Marlboro Music Festival, the Ravinia Festival and Prussia Cove. ClassNotes offers a one-day workshop or a one-week residency in schools. The one day workshop intersperses performances by ClassNotes’ musicians with interactive listening and improvisatory dramatic games. This workshop explores the concept of classical music as an outlet for emotion, energy, and creativity. The one-week residency is more intensive; ClassNotes works with teachers in advance to create customized lessons that integrate music into the academic curriculum. At the end of the week, the students and their families are invited to a concert by ClassNotes’ musicians featuring pieces they’ve been hearing and studying all week. Every piece of music contains a blueprint for the entire range of human emotions. While we believe in the sound pedagogical benefits of connecting music with other academic disciplines in our school workshops, our true mission is to inspire people to love classical music as we do and to find their own emotional connections to the music. By presenting the music in an exciting and accessible way, our dynamic musicians convey to students that listening to classical music engages a rollercoaster of feelings and memories that can take one from highs of exhilaration to depths of contemplation, with everything in between.